this guy has some obvious talent. not only does he capture our attention, he holds it with his humor and comedian-like presence. unlike most short films and podcasts that barely pass as remotely amusing, this guy deserves two thumbs up, a snort-filled knee-slapping guffaw, and lots of laughter. lookin for some worthwhile stuff? subscribe to him and satisfy your comical cravings that can not be satisfied any other way!!!! I was drawn into the podcast simply by the descriptions of the episodes. However, after quickly watching one or two of the episodes, I was ADDICTED. I found myself subscribing to the podcast almost right away! Definitely worth a second look. hi this dude is so awesome! hes the best director and uncle! I've only recently subscribed to the Podcast because I was used to going to your website. But I also want to spread the word and help (even if little) The Romeo Theatre to continue it's success. Its nice to see there's someone out there creating and encouraging quality stuff. I can't stand all of that youtube crap. Good job Romeo Theater. The shorts are entertaining, but I find the back story even more interesting. I wish other podcasts with featurettes would include the inside information like he does. It's also cool seeing locations I know here in Virginia.... like Richbrau, when I was there I never would have guessed I was in heaven! Takes The Internet To The Next Level! Really interesting use of Podcasting. Never boring, always informative and funny. Check it out. He does for film what MTV did for music videos. 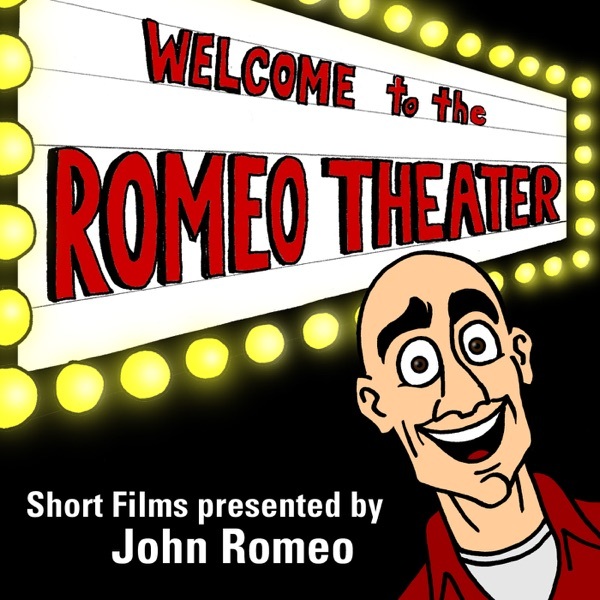 The Romeo Theater offers short films that bring humor and thoughtfulness to everyday situations. People without an open sense of humor will not like what they see here. It's refreshing to know there are truly creative people out there willing to share their vision for FREE! Keep up the good work and especially the humor that is plain old fashioned fun. You are on the ball and I wish you much success. Inventive and always humorous with some good video/audio editing to boot. The Romeo Theater is a breath of fresh air in the growing pollution of podcasts. Like a box of CrackerJacks, you never know what you're gonna get the next time you open one -- each episode is a surprise. Keep 'em comin'! John Romeo shows the humor and humanity in the mundane (and sometimes extraordinary) scenarios of everyday life. The music by Jeff Newkirk is amazing! Let's hope these guys keep it up for a long time. FINALLY! Postmodern sensibilities catch up to modern-day technologies, and the art and craft of a true cinematic auteur are on display. It's as if Francois Truffaut, Federico Fellini, Jerry Seinfeld, Lenny Bruce, Ingmar Bergman, Buster Keaton and Quentin Tarintino all met for coffee and some laughs, and this is the result. If John Romeo doesn't win the first ever Academy Award for Excellence in Podcast Featurettes, well. There's no justice, and that's just not a world I want to live in. this show is a lot of fun. it's a cool idea, and i'm interested in seeing what movies other people submit. This is one of the most entertaining and creative podcasts, I’ve ever seen. Romeo has a unique and exiting way of telling a story, You never can quite tell were it’s going. This is exactly what we should expect from this new web based medium — People out there producing something new, original and refreshing like John Romeo. Keep up the great work. It's like opening a surprise package every week! I love the inventive story ideas, the great video and the backstory about how it all comes together. This is quality entertainment free of the agendas of big studios, big money and big business. I can't wait to see the next one! I give the Romeo Theater Podcasts 2 thumbs way up! They are laugh-outloud-funny. I love that John captures the humor in otherwise ordinary situations. The brief videos and tid-bits of techinical information will keep my coming back for a break from the real thing. Metamucil, drier sheets, the Duke boys, and paint eating...I can't wait to see where the Romeo Theater goes next! This podcast is a totally fun and worthwhile experience. The short features range from subtle humor to the totally slapstick. John Romeo's "Seinfeldian" vision takes everyday situations and conversations from his life and friends and puts them under the "funny microscope" with very pleasing results. Another great thing I love about theses podcasts is the unique "making of" sections that follow each story. He covers outtakes, stunts and even storyboards. Very cool! You've got to check it out! From the humor, to the detail, to the great production, this is an awesome show!